Jordan Brand is expected to hit strides once again starting this weekend with the release of a new edition of the Air Jordan 3 Retro. 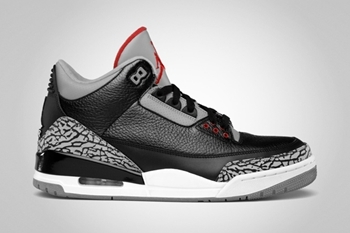 The Air Jordan 3 Retro will be released in Black/Varsity Red – Cement Grey this Friday, November 25, and three days before its release, the shoe is already gaining a lot of attention. The silhouette features a black leather upper paired with cement gray tongue and inner lines and enhanced with elephant prints on the toebox and heel plus varsity-red colored Jumpman logo on the tongue. Mark your calendar now and make sure to grab one this weekend!